Connor Jones has neither excelled nor struggled during his first full season in the Texas League. He took a major step in the right direction Tuesday night. 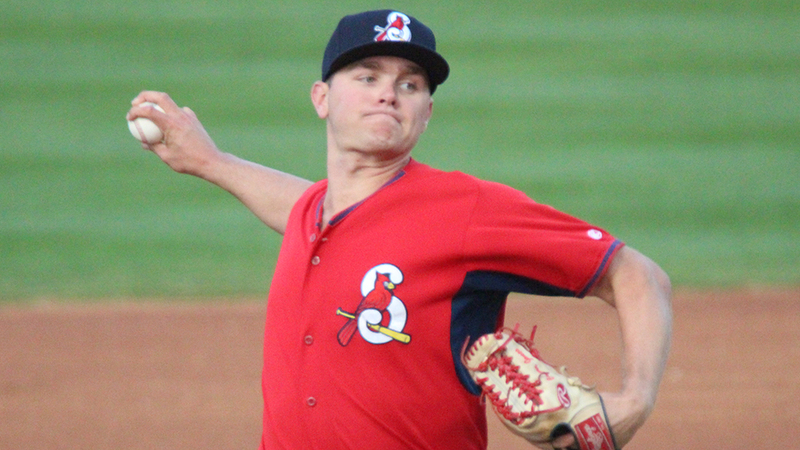 The Cardinals' 19th-ranked prospect gave up one hit and struck out a season-high six over seven scoreless innings as Double-A Springfield defeated Tulsa, 3-1, at Hammons Field. Jones allowed one baserunner through the sixth and did not yield a knock until Zach Reks singled with one out in the seventh. "I feel like I've been throwing really well the last few outings," Jones said. "My fastball command was great tonight and I was able to work it on both sides of the plate while mixing in some off-speed stuff. My defense also played great behind me, which is key for a ground-ball pitcher like myself. "It was a continuation of how things have started to click into place. I've been making some adjustments from start to start. Most of that involves staying over my back leg more and not rushing to home plate too quickly. I was doing that a lot early in the season, but working on that has helped me a lot." The 23-year-old retired the first 11 batters before plunking Connor Joe with two outs in the fourth. He set down the next four Drillers, took his no-hit bid into the seventh and issued a leadoff walk to Dodgers No. 27 prospect Luke Raley. The right-hander got Joe to line to center field before Reks broke through on an 0-2 pitch. "It's pretty hard not to notice what was going on," Jones said of the no-hitter. "But you try not to think about it too much. I had run some deep counts early in the game, which is a bit out of the ordinary for me, but I also knew it would take something outrageous for me to finish the game [with a high pitch count]. I just wanted to keep putting up zeros." Jones (4-2) equaled the longest outing of his career by getting through the seventh when he retired fourth-ranked Yusniel Diaz on a liner to right and No. 8 Will Smith on a grounder to shortstop. The Hartford, Connecticut, native completed seven innings twice last year, most recently on Aug. 26 with Class A Advanced Palm Beach. "When you're feeling good, you're feeling good," Jones said. "I made sure to start off each inning crisp and when things are going well, you're able to get an idea of how to attack the hitters. That's especially true when guys aren't on base." The University of Virginia product made one start for Springfield last season after going 8-5 with a 3.97 ERA in 24 games, including 21 starts, in the Florida State League. Having gone through the Texas League a few times, he's learning what has to be done to keep up with the elevated talent. "You have to consistently make good pitches," Jones said. "It's the kind of level where, if you don't execute, you'll get hurt. There's typically one guy on each roster here who has big league time, so the challenge is real. I'm out there trying to improve and focusing on the finer points while paying attention to all the little details I can. "This was already the third time I've faced Tulsa this season, so it gives you an idea how your stuff plays. But it's a work in progress. Ever since I was drafted, I've been working through a lot of adjustments. Heading into this season, I finally felt like I had found something and that I didn't need to make any big changes. There's always a few tweaks here and there, but I feel like I've been very consistent since we started." Estarlin Arias gave up a run in 1 1/3 innings and Colton Thomson walked both batters he faced before Yeison Medina worked out of a bases-loaded jam in the ninth for his second save. Springfield scored all its runs in the fourth, highlighted by Chris Chinea's two-run blast, his third homer in the last seven games. Tulsa starter Mitchell White (0-3), the Dodgers' No. 3 prospect, surrendered three runs on four hits and two walks with six strikeouts in 3 2/3 innings. Diaz walked with the bases loaded in the ninth to plate the Drillers' lone run.